Overall the paper was from moderate to tough level. Legal Reasoning Subject was tough and mathematics was toughest. General Awareness section was better than the previous year Questions. As for the Verbal Ability Section, many students found a few questions confusing. Total 120 minutes given to answer 200 Questions. Also there is a 0.25 marks negative marking for each wrong attempt. 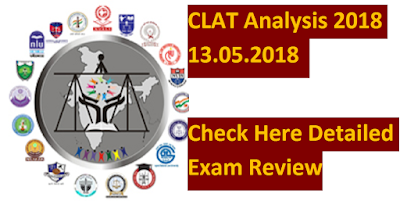 Actual cut off for CLAT 2018 would be released on June 7, when the counseling begins. We expect that the CLAT 2018 Cut off for top NULs would go between 125 – 155 marks for CLAT UG(Under Graduate) admissions. I. Atleast some designs are graphics. II.No pattern is a graphic. II.Atleast some roots are branches.